What a great guitar to travel with or play gigs. Heavy duty case, 2 extra sets of guitar strings, truss rod wrenches, even the owners manual! Totally complete. Cool guitar! This is NOT the transcale model.". Neck Truss Rod:You can adjust the neck, truss rod also has worked. Carefully taken from a guitar magazine. for that special fan, collector or guitar owner. in a waterproof poly bag envelope with. Carefully taken from a guitar magazine. for that special fan, collector or guitar owner. in a waterproof poly bag envelope with. and are not reproductions or copies. size: approx. 8" x 11"(20 cm x 28 cm). It is not a copy, reprint or repro of any kind. Don't just think of these as old pieces of paper. These are pieces of history. Many old ads have detailed info about the product they are advertising and can help with research. Great condition. 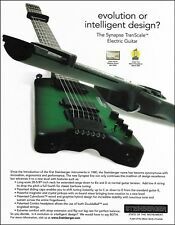 From a Steinberger XS15-FPA. We do not know if this will fit your guitar. We will never promise a part will fit your guitar. Truss rod: The truss rod is tightened to the limit. B.B. King Signature 2005 Gibson LUCILLE BLACK Electric Guitar w/ hard case used. Scale: 630 mm. Body: Maple top / Ash bag. The unique double cutaway body and deeply dropped "Comfort Cutaway" on the back side, Pearl Wing Inlay also attract the eye. Body type: headless guitar. Here is the category of Electric guitar. Our Products are 100% Authentic. Body type headless guitar. B.B. King Signature 2005 Gibson LUCILLE BLACK Electric Guitar w/ hard case used. Accessories Soft case. Asia, Middle East. Even if you think to yourself, "But the item I want is only available in Japan.". Body type: Headless guitar. This product is designed to be used in Japan. we would find for you! We are really happy that you are interested in Japanese item! (it might be more than a month). so, do not worry about it.